These beading patterns for beginners are a great way to start stitching! So you want to be a beader, but you're not sure where to begin? Well, you've come to the right place. This collection of beading patterns for beginners includes all of the most important and fundamental weaving techniques in the art of beadwork, so it's the perfect entry point to begin your beading journey. There is a variety of ways to stitch or weave beads, and here we've rounded up beginner tutorials on some of the essential techniques that you will want to learn if you are truly interested in learning how to bead DIY jewelry pieces. In this collection, you'll find tutorials for how to peyote stitch, how to brick stitch, how to square stitch, how to right angle weave, how to ladder stitch, and more. Once you've mastered these basic beading fundamentals, you'll be ready to tackle different beading designs and patterns of all kinds. That's why we've also included some super simple beginner beading projects so that once you're feeling comfortable, you can put your skills to the test with some actual beaded jewelry patterns. Learn the stitches and then put them to use with this comprehensive collection of beading tutorials! Fall in love with ladder stitch! Beginner beading can be intimidating. We recommend beginning with the ladder stitch. Check out the video above to learn how to do this handy technique! It might not be one of the more prevalent bead stitches on its own, but it does provide the base for other stitches such as brick and herringbone, so it's an important one to have in your repertoire. These beading patterns for beginners will help you practices stitching without feeling overwhelmed. If you prefer written instructions, you might prefer to learn how to ladder stitch with the second tutorial provided. 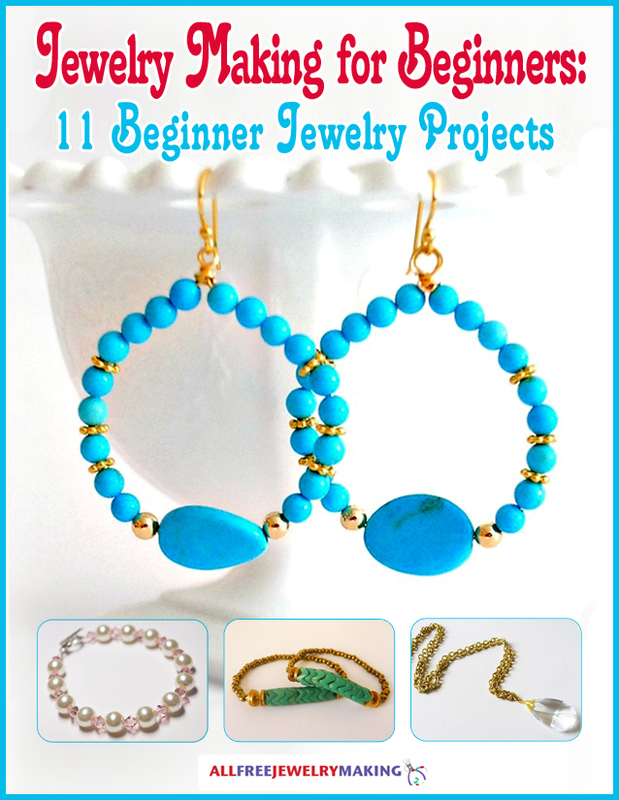 Then try incorporating your newfound skills into an actual jewelry project by trying the bracelet pattern provided. The basic ladder stitch is a simple beading technique that is the base of so many beautiful beading designs. Watch and learn how to ladder stitch in this basic ladder stitch video tutorial. Video tutorials are not for everyone, so you can also get started with ladder stitch by following this illustrated, step-by-step tutorial. This clear, basic tutorial is an easy way to step into the world of ladder stitch. Once you have learned the basic technique of how to ladder stitch, put your new-found skills to the test! This lovely lilac wrap bracelet is simple and a great way to use the seed beads in your stash. You do not need to stick to basic seed beads in the ladder stitch! This easy tutorials shows you how to use two-hole beads to create a beaded wrap bracelet. This pattern is so easy to customize, too! Now for basic brick stitch! Next up is brick stitch, another very common and fundamental beadwork technique. You'll see this weave come up a lot as you begin to browse beaded jewelry patterns, so you'll definitely want to add this stitch to your skill set. This beginner beading tutorial is accompanied by a helpful video component, so learning how to brick stitch should be a breeze. Get the basic stitch down first; then once you're comfortable, let loose a little by trying freeform brick stitch, and finish off by making a full brick stitch bracelet! Brick stitch builds off of a foundation layer of ladder stitch, so once you have learned how to ladder stitch, you are already on your way to mastering brick stitch! This basic video tutorial shows how to brick stitch, step by step. Hate feeling tied down by one type of bead? Break free from creative restraint by making this freeform brick stitch bracelet. You can use a variety of beads in this pattern, making it the perfect stashbuster pattern. Creating a piece of brick stitch beadwork does not have to be an all-day affair! These simple and charming beaded dangle earrings only take a couple of hours to make, and are a great way to practice brick stitch on a small scale. Diamonds are a girl's best friend, and brick stitch will be a close second once you give this beginner-friendly beading pattern a try. You can personalize this pattern by using beads in your favorite color, or even several colors! Elegant opalescent hues take this simple bracelet up a notch from basic to beautiful. The neutral tones of this bracelet make it the perfect pattern to wear every day, or you can try it in a different color scheme to match a special outfit. Popular Peyote Stitch! Peyote stitch is one of the most popular beading techniques. Learn how to peyote stitch with this easy-to-follow, step-by-step tutorial, and you'll have the hang of it in no time. Once you've the technique and tension down, try tackling one of the easy peyote stitch bracelet patterns we've included below. Learn the basics of this popular bead weaving technique in this easy step-by-step tutorial. Even if you are brand new to beading, this tutorial has clear photos and instructions that anyone can follow. Bead outside of the lines! While flat even or odd-count peyote are the most common forms of this stitching technique, you can also create some really cool beading designs with this circular peyote stitch technique. Make a simple statement with two of your favorite colors in this color block bracelet pattern. Sophistication does not have to mean complicated. This beginner level project is the perfect combination of easy and elegant. Copper is a popular color scheme and material for making jewelry, and you don't even have to use wire! Two shades of copper seed beads take this bracelet from blah to beautifully neutral. Looking for an extra easy tutorial to get started with peyote stitch? This simply elegant bracelet is a good choice for beginners who are itching to get stitching. Two colors of seed beads make this bracelet pattern easy to customize. Dress up a pretty donut bead pendant with just a touch of peyote stitch. The smooth stone pendant and glamorous gold seed beads have a cool texture and contrast that makes this project look very modern. Stunning Square Stitch! At this point, you might be wondering why you need to learn so many different flat bead weaving techniques, but they do each serve a separate purpose and function in beaded jewelry patterns! You'll want to learn how to square stitch for when you're creating a piece that needs a more grid-like structure, as the first beginner tutorial explains. Square stitch is also a more accessible alternative to loom weaving, as it has the same look but does not require the expensive equipment. Learn the fundamentals with either the first or second tutorial; then put them to practice with the square stitch bracelet pattern provided. Get the look of loom woven jewelry without the extra expense and hassle of a bead loom. Square stitch is perfect for beaders who love the look of Native American inspired jewelry. Square stitch trim is a finishing technique that can add a professional look to a handmade jewelry pattern. Square stitch works well on curves, in addition to straight lines, so this technique is very versatile. Inspired by the designs of Ancient Egypt, this square stitch bracelet pattern is a cool new way to create a friendship bracelet. Gift this bracelet to a friend, or keep it for yourself! Channel the artsy, elegant style of the Art Deco period with this square stitch earrings pattern. The bold, geometric shapes of the 1920s and 1930s have never gone out of style, so neither will these earrings. Ravishing Right Angle Weave! If you like beadwork that looks a bit more open and airy, you'll want to learn how to right angle weave. This beading technique creates a grid of squares with space between the beads for a more "light and lacy" look. Right angle weave can be a bit more difficult to get the hang of, so follow along with the step-by-step photos provided in the first tutorial to understand the technique. Then try one of the beginner bracelet patterns incorporating right angle weave below after you've got it down. Right angle weave is a technique you'll see everywhere once you begin to try a lot of beadwork patterns. It can be a challenge to get the right tension when beginning this stitch, but once you perfect it, it is a breeze. Basic does not mean boring! This super simple right angle weave bracelet uses a pretty mix of pastel colors to create a unique design. Make a beautiful bracelet you'll love to wear without all of the stress! A mix of crystal bicone beads and round or fire-polished beads gives this bracelet a a fun contrast from the ordinary. You can use a variety of beads to make this pattern, so it is a great way to clear out your stash. Can you believe this intricate, woven bracelet is suitable for a beginner? Believe the hype, because this tutorial shows how to bead an easy right angle weave bracelet that looks totally complex. Hot Herringbone Bead Stitch Patterns! Have you ever tried learning how to do herringbone stitch beading? If you have already learned how to ladder stitch, it will be a breeze! The first row of flat herringbone stitch frequently begins with a row of ladder stitch, then adds additional rows with two beads at a time to create the famous herringbone stitch texture. More interested in the tubular herringbone stitch? We have a pattern for that, too! If falling in love with a pair of earrings is wrong, I don't want to be right! These dreamy, pastel earrings combine dainty seed beads with shimmering metallic accents to create an envy-inducing pair of earrings. Everyone loves a spiral, and tubular herringbone stitch is a great way to bead with this alluring shape. It takes a few rows to get the hang of this technique, but once you pass the first few rows, you'll be unstoppable. Bead your way to some ho-ho-holiday spirit!. This classic red and white herringbone stitch bangle is perfect for the holiday season, but subtle enough to wear all year long. What is your favorite stitching pattern? .I can't believe you offered all of these patterns and tutorials for free. I was going to head to the craft store to get a beginners book on bead weaving. Then I saw this. It's wonderful. So many designs, so very clear tutorials. Pictures and instructions, step by step. This is so very generous of all of you. Thank you so very much.